Ireland's deputy prime minister has said his country has "no desire" to delay the UK's Brexit talks. But Simon Coveney also warned that not enough progress had been made on the border with Northern Ireland. While Ireland was not looking for "full detail", it was seeking the parameters within which a solution could be found. His comments came ahead of a week of crucial decisions on whether the UK and EU would move ahead to the next phase of Brexit negotiations. UK Prime Minister Theresa May is due to meet European Commission President Jean-Claude Juncker on Monday to assess whether sufficient progress has been made on three core issues of citizens' rights, the "divorce bill" and the future of the Irish border with Northern Ireland. The 27 other member states will then meet on Wednesday to make a decision on going to a second phase of talks. What does Ireland say about the border? Mr Coveney has been heavily involved with Ireland's stance on Brexit since becoming the foreign minister during the summer. He was also appointed as tánaiste - deputy prime minister - following the resignation of his colleague, Frances Fitzgerald, over a political row that threatened to bring down the government. Speaking on the BBC's Andrew Marr Show, he said Ireland did not want to exercise its veto on the issue. "There is no desire, I can tell you, in Ireland, to delay this process," he said. "But at the same time, we have a responsibility as a government to represent the interests on the island of Ireland. "We believe that, as an island, Ireland is uniquely vulnerable and exposed to a potential bad outcome from Brexit. "That is why we are looking for more progress than we have." He also denied suggestions, made by some UK politicians, that the issue was being used to pave the way for Irish unity. "That's simply not true," he said, adding that the government had maintained a consistent position for months. He said he was very keen to avoid "a green versus orange debate" between unionism and nationalism. "Instead we're trying to protect the status quo." "We cannot allow some kind of collateral damage or unintended consequence of Brexit to have the recreation of a border." In June, the Democratic Unionist Party (DUP) signed a confidence-and-supply deal with the UK's minority Conservative government. DUP deputy leader Nigel Dodds told the BBC there had been a much more aggressive stance on Brexit from the Irish government since Prime Minister Leo Varadkar and Simon Coveney had taken office. He argued they wanted to dismiss technological solutions, which would prevent a hard border in Northern Ireland. "They say none of that is acceptable. It has to be a political solution which involves the UK staying inside the single market or the customs union, or failing that Northern Ireland doing so," he added. Meanwhile, former UK prime minister Tony Blair told the BBC that a hard border would "obviously" cause tensions that could put the Good Friday Agreement - a landmark in the Northern Ireland peace process - at risk. Why is the May-Juncker meeting significant? Mrs May's scheduled lunch with the head of the European Commission is widely seen as her chance to persuade the EU to move negotiations forward. Along with the Irish border, other issues that the EU says must be agreed are the size of the UK's payment to the EU - the so-called divorce bill - and the status of EU nationals living in the UK. Mr Juncker will also meet European lawmakers before his lunch with Mrs May, possibly to discuss the UK's offer on citizens' rights. Progress on the "divorce bill" was made last week when it emerged that the UK had offered the EU a sum of up €50bn (£44bn). Some Brexit supporters have complained that the sum is too high. The Leave Means Leave campaign group on Sunday issued an open letter to Mrs May, urging her not to settle the divorce bill without a series of agreed conditions. Donald Tusk, President of the European Council, said on Friday the EU was "fully behind" Ireland's demand for no hard border on the island. "The Irish request is the EU's request," he said, adding that he would consult the Irish prime minister before the next stage of Brexit talks. 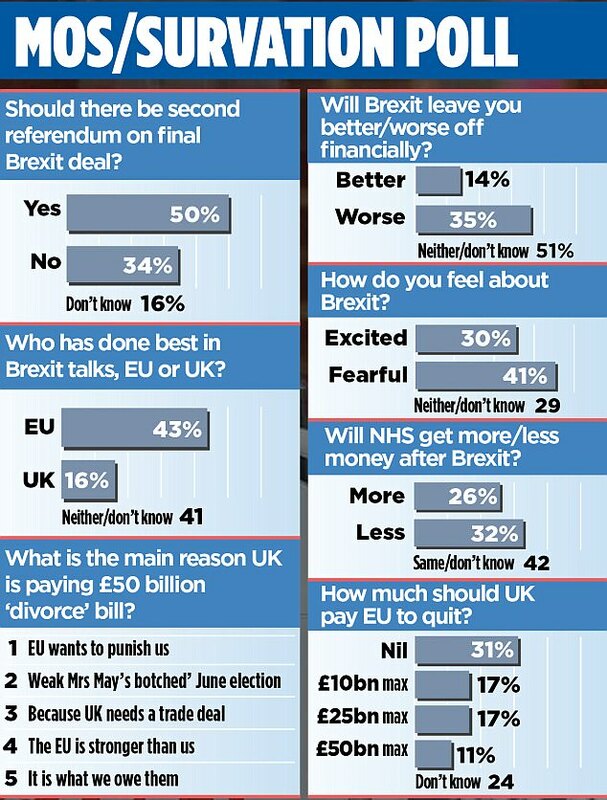 There is a real possibility that this is heading for a 'soft Brexit' which would be worse than staying in the EU completely. Theresa May is being too soft. As far as I know, this 'divorce bill' has no legal basis and we should pay nothing at all. And how we treat the border with the Republic of Ireland is none of the EU's business. Do they try to tell Russia and Turkey how to control their borders? @Neon Knight wrote: There is a real possibility that this is heading for a 'soft Brexit' which would be worse than staying in the EU completely. Theresa May is being too soft. As far as I know, this 'divorce bill' has no legal basis and we should pay nothing at all. And how we treat the border with the Republic of Ireland is none of the EU's business. Do they try to tell Russia and Turkey how to control their borders? I didn't read anywhere what is the legal basis of this divorce bill. But they are angry with the UK, EU fears other will leave after Britain. What the problem with the UK and and Ireland border? The Irish government wants a system whereby Northern Ireland would remain in the single market and customs union, which would mean it would have to obey EU standards post-Brexit. This would means there would be no border checks although this has been ruled out by Mrs May. Yet Republicans view Brexit as a chance to push through a referendum on the reunification of Ireland, a move which would break up the UK. There are fears there could be a return to the hard border of the Troubles-era if a hard border was to return, something which has not existed since the Good Friday Agreement. What’s all this nonsense from the Irish about no hard border? I lived in Londonderry from 1969 to 1972 and the customs posts on the main roads opened at 8am and closed at 6pm. The rest of the time the border was wide open. There were hundreds of roads crossing the border without any controls. I once saw pigs being smuggled across along a back road. It seems to me it’s a complicated issue. Hopefully won’t be “troubles” again. Soft border seems less risky, but I’m not sure. There is no perfect solution. Will be a second vote? Many pll became uncertain. The UK and EU have failed to reach an agreement to move to the next stage of Brexit talks, Theresa May has said. The prime minister said talks would reconvene "before the end of the week" and she was "confident we will conclude this positively". The talks are understood to have broken down after the DUP refused to accept concessions on the Irish border issue. Downing Street said that was not the only outstanding problem. Irish Prime Minister Leo Varadkar said a deal had been done but the UK appeared to have changed its mind over the Irish border question. "I am surprised and disappointed that the British government now appears not to be in a position to conclude what was agreed earlier today," he told a press conference in Dublin. Mrs May is understood to have broken off from talks with European Commission President Jean-Claude Junker to speak to DUP leader Arlene Foster. The UK had reportedly been prepared to accept that Northern Ireland may remain in the EU's customs union and single market in all but name. But Mrs Foster then said her party "will not accept any form of regulatory divergence" that separates Northern Ireland from the rest of the UK. "During the call it was made plain to the PM that the DUP had significant concerns about the deal being discussed that gave concessions to the Dublin government," said the BBC's political editor Laura Kuenssberg. "I understand Mrs Foster told Theresa May that she would not be able to support such a deal. "It's been suggested too that there are 20 or so Conservative MPs who had serious misgivings about the compromises that were understood to be on the table." Northern Ireland's DUP (Democratic Unionist Party) has 10 MPs at Westminster and their support is vital to the government. This is because the Conservatives are without a Commons majority since June's general election, and rely on a deal with the DUP to ensure they can survive key votes. Why is the DUP unhappy about the plan? DUP leader Arlene Foster said her party would not accept any Brexit deal that "separates" Northern Ireland from the rest of the UK. Her party's Brexit spokesman Sammy Wilson claimed Brussels has been trying to "bounce the prime minister into acceding to the shape of a deal they want" and many of her own backbenchers would not accept it. He said the DUP objected to the form of words used in a draft document, which he said referred to "regulatory alignment" and "no regulatory divergence" between Northern Ireland and the EU. Both phrases were "simply EU speak for keeping Northern Ireland in the European market" and "in effect, part of the United Kingdom would be kept within the single market," he said. Asked if the DUP would pull out of the confidence and supply agreement they have with the Conservative government in Westminster over this issue, he said: "I think that her (Theresa May) problem isn't going to be just with the DUP". Leo Varadkar says he wants a written guarantee that there will be no return to a "hard border" between the Republic and Northern Ireland - and this is what he thought he had got. "I am surprised and disappointed that the British government now appears not to be in a position to conclude what was agreed earlier today," he said. "I accept that the prime minister has asked for more time and I know that she faces many challenges, and I acknowledge that she is negotiating in good faith. "But my position and that of the Irish government is unequivocal: Ireland wants to proceed to phase two. "However, we cannot agree to do this unless we have firm guarantees that there will not be a hard border in Ireland under any circumstances." He said it was important to listen to the DUP, but also to bear in mind the position of other parties in Northern Ireland - and it should not be forgotten that the majority in Northern Ireland voted to remain in the EU. Speaking at a joint press conference in Brussels with Mr Juncker, Mrs May said: "We have been negotiating hard. And a lot of progress has been made. And on many of the issues there is a common understanding. "And it is clear, crucially, that we want to move forward together. "But on a couple of issues some differences do remain which require further negotiation and consultation." What did Jean-Claude Juncker say? The European Commission President said "it was not possible to reach complete agreement today" despite their "best efforts". But he added: "I have to say that we were narrowing our positions to a huge extent today, thanks to the British prime minister, thanks to the willingness of the European Commission to have a fair deal with Britain. "I'm still confident that we can reach sufficient progress before the European Council of 15 December. "This is not a failure, this is the start of the very last round. "I'm very confident that we will reach an agreement in the course of this week." Labour leader Jeremy Corbyn said: "The real reason for today's failure is the grubby deal the government did with the DUP after the election." He added that "Labour has been clear from the outset that we need a jobs-first Brexit deal that works for the whole of the United Kingdom". Conservative MPs emerging from a Downing Street briefing on the talks said they had been told Mrs May had not agreed the proposal on regulatory alignment put forward by the Irish government. Leading Brexiteer Jacob Rees-Mogg said that the Conservatives were "as one" with the DUP on the importance of keeping the United Kingdom together, and the mood among Tory MPs in the meeting was "contented, not divisive or unhappy". Backbench Remain supporter Anna Soubry said no Conservative MP wanted Northern Ireland treated differently from the rest of the UK, which she said would be "a gift" to the Scottish National Party. The "simple solution" would be for the whole of the UK to remain in the single market and customs union, she added. Lib Dem Brexit spokesman Tom Brake said: "As each day goes by, it becomes clearer that the best deal for everyone is to stay in Europe. The people of the UK must be given a vote on the deal and an opportunity to exit from Brexit." and London Mayor Sadiq Khan. The EU says it will only recommend the start of talks about future trade arrangements when it deems "sufficient progress" has been made on three issues - the status of expat citizens, the "divorce" bill and the Northern Ireland border. The UK has been set a deadline of this week to come forward with an improved offer on them, and hopes that the go-ahead for future talks will then be given at an EU leaders' summit on 14-15 December. On the "divorce bill", the UK is understood to have recently increased its offer, which could be worth up to 50bn euros (£44bn). On the issue of rights for the three million EU citizens in Britain, the UK has agreed that those who already have permanent residence will not have to pay to apply for settled status. Those making a first time application for the right to stay after Brexit, however, will face a charge - reportedly similar to the cost of applying for a passport. Settled status will grant those who have spent five years in the UK equal rights on healthcare, education, benefits and pensions to British citizens. Ministers have already suggested people legally resident in the UK before an as yet unspecified cut-off date will be allowed to stay and they want to make the process "as easy as renewing a driving licence". Scottish First Minister Nicola Sturgeon said that if Northern Ireland was allowed to operate under different rules there was "surely no good practical reason" why other parts of the UK could not do the same - a message echoed by Welsh First Minister Carwyn Jones and London Mayor Sadiq Khan. The Republic of Ireland would use it to further the cause of a united Ireland and the Scottish seperatists would use it for their purpose. Magyar Lány wrote: Will be a second vote? Many pll became uncertain. It is unlikely. If there was, I'm not sure it would include the option of staying in the EU, it might just be a matter of accepting the deal or leaving without a deal. New language for a draft Brexit deal on the Irish border has been proposed in talks between the UK, Ireland and the EU Commission, the BBC understands. BBC political editor Laura Kuenssberg says she's been told it has been shared with the DUP, whose opposition on Monday led to talks breaking down. Another source told her the "dynamic is positive" but a government source says "we're not there yet". All sides want progress on the issue ahead of a crucial summit next week. European Council President Donald Tusk is due to make a statement on Brexit on Friday morning, prompting speculation that a deal is closer. And European Commission spokesman Margaritis Schinas tweeted that talks would continue into the night adding: "We are making progress, but not yet fully there." What happens to the border between Northern Ireland and the Republic of Ireland has been among the key sticking points in Brexit negotiations. On Monday, the Democratic Unionist Party (DUP) - whose support the UK prime minister needs to win key votes in Westminster - objected to draft plans drawn up by the UK and the EU. The DUP said the proposals, which aimed to avoid border checks by aligning regulations on both sides of the border between Northern Ireland and the Republic of Ireland, were not acceptable. The party has said it will not accept any agreement in which Northern Ireland is treated differently from the rest of the UK. The Republic of Ireland - which is an EU member - says it wants a guarantee that a hard border will not be put up after Brexit. But there is no official confirmation of that and a UK government source said that the two sides were coming closer together but stressed that no agreement had been reached. Earlier this afternoon a DUP source suggested there had been no breakthrough. But the Reuters news agency has quoted an Irish source suggesting a deal on the border is "very close". PM Theresa May has struck a last-minute deal with the EU in a bid to move Brexit talks on to the next phase. There will be no "hard border" with Ireland; and the rights of EU citizens in the UK and UK citizens in the EU will be protected. The so-called "divorce bill" will amount to between £35bn and £39bn, Downing Street sources say. The European Commission president said it was a "breakthrough" and he was confident EU leaders will approve it. They are due to meet next Thursday for a European Council summit and need to give their backing to the deal if the next phase of negotiations are to begin. Talks can then move onto a transition deal to cover a period of up to two years after Brexit, and the "framework for the future relationship" - preliminary discussions about a future trade deal, although the EU says a deal can only be finalised once the UK has left the EU. A final withdrawal treaty and transition deal will have to be ratified by the EU nations and the UK Parliament, before the UK leaves in March 2019. Northern Ireland's Democratic Unionist Party, whose opposition on Monday led to talks breaking down, said there was still "more work to be done" on the border issue and how it votes on the final deal "will depend on its contents". Mrs May depends on the party's support to win key votes in Westminster. The pound was trading at a six-month high against the euro as news broke of the draft agreement. Guarantee that there will be "no hard border" between Northern Ireland and the Republic and that the "constitutional and economic integrity of the United Kingdom" will be maintained. Financial settlement - No specific figure is in the document but Downing Street says it will be between £35bn and £39bn, including budget contributions during a two-year "transition" period after March 2019. The UK government and the EU want to maintain the free flow of goods, without border checks that they fear could threaten a return to The Troubles, but the DUP does not want Northern Ireland to be treated differently to the rest of the UK after Brexit. The joint EU-UK document says any future deal must protect "North-South co-operation" and hold to the UK's "guarantee of avoiding a hard border". The agreement also says "no new regulatory barriers" will be allowed between Northern Ireland and the rest of the UK, and that Northern Ireland's businesses will continue to have "unfettered access" to the UK internal market - a passage thought to have been added to meet DUP concerns. But it also sets out a fallback position if the UK fails to agree a trade deal. This could prove controversial because it says there will continue to be "full alignment" between the EU and Northern Ireland on some elements of cross-border trade, as set out in the Good Friday Agreement. The DUP would have preferred this not to be in the agreement, says the BBC's Chris Morris, and there could be some hard negotiating to do further down the line. Citizens' rights - same for everyone? Agreement has been reached on what happens to the three million EU citizens living in the UK and more than a million UK citizens in EU states after Brexit. EU citizens currently in the UK would be allowed to continue living and working there - and those already in the country who do not yet have permanent residency would be able to acquire it after Brexit. Freedom of movement could continue for two years after March 2019, although the UK says new arrivals will have to register. The plan is that UK citizens in living in an EU country would get the same rights, although they would not retain them if they moved to another EU country. But the campaign group the 3million, which represents EU citizens in the UK, said there was "still no clarity around the registration criteria for these rights" and said of the eight years: "Our rights should not have an expiry date". Brexit: What now for EU citizens in the UK? A figure is not mentioned in the text of the agreement but Downing Street sources says it will be between £35bn and £39bn. It will be paid over four years and the precise figure is unlikely to be known for some time. EU Brexit negotiator Michel Barnier said the EU had agreed to drop the cost of relocating UK-based EU agencies from the final divorce bill. priorities at home, such as housing, schools and the NHS". Technically a future trade deal cannot be signed while the UK remains a member of the EU but "preliminary and preparatory discussions" can begin. But the EU's chief Brexit negotiator Michel Barnier has said the withdrawal treaty and transition deal need to be ready by October 2018 - in order that they can be ratified by March 2019, before the "real negotiation" begins on the future relationship. Mr Barnier suggested on Friday that the only option for a future trade arrangement was a Canada-style deal, rather than a one based on Norway, which retains free movement and unrestricted access to the single market but pays into the EU budget. The European Council wants the UK to remain a "member" of the EU's customs union and single market and to remain under the full jurisdiction of the European Court of Justice during the transition period, according to a leaked document. What has changed since Monday? The DUP, whose opposition on Monday led to talks breaking down, say there have been six "substantial changes" to the text. Party leader Arlene Foster said they would mean there was "no red line down the Irish Sea" - meaning no customs barrier between Northern Ireland and the rest of the UK. But BBC Northern Ireland economics editor John Campbell says there is a lot of hard negotiating to come and compromises to be made. Another interpretation of the deal is that that it still leaves the door open for a special status for Northern Ireland, he adds. The prime minister made her decisions on Thursday night while the No 10 Downing Street Christmas party carried on. It isn't celebration on Friday though for her government, but relief. Theresa May's cabinet colleagues heaped praise on her, with Environment Secretary Michael Gove saying it was a "significant personal political achievement" for Mrs May while Foreign Secretary Boris Johnson tweeted: "Congratulations to PM for her determination in getting today's deal." But Labour's Brexit spokesman Sir Keir Starmer said Mrs May should "seriously reflect on her approach to the negotiations so far". He added: "Despite being two months later than originally planned, it is encouraging that the European Commission has recommended sufficient progress in the Brexit negotiations." DUP Leader Arlene Foster said it meant that Northern Ireland would "not be separated constitutionally, politically, economically or regulatory from the rest of the United Kingdom" and "in all circumstances the United Kingdom will continue to ensure the same unfettered access for Northern Ireland's businesses to the whole of the UK internal market". Scotland's First Minister Nicola Sturgeon tweeted: "Move to phase 2 of talks is good - but the devil is in the detail and things now get really tough." Lib Dem leader Vince Cable, who backs a referendum on the final deal, said "it reduces the risk of a catastrophic no-deal Brexit" but questioned if it would last or be "torn apart by Theresa May's own MPs". Former UKIP leader Nigel Farage told the BBC the estimated bill was "way more than we need to pay" and he was unhappy that the European Court of Justice would continue to have a role for up to eight years. "The whole thing is humiliating. We have collapsed at every level." This Brexit news on bbc are so long, I'm not sure I will post another one. It saves me having to watch the news But, yeah, these negotiations will go on for over a year yet, so we can just come back to this thread if anything dramatic happens. If you like it I will post these news, but it will be so long like a novel. I was afraid these long posts are boring. They are not boring, but to save time you can just post a link and the first few sentences of the article - you don't have to post the whole thing. An agreement to move on to the next phase of Brexit talks is "good news" for both Leave and Remain voters, Theresa May has told MPs. She told Parliament it should reassure those who feared the UK would get "bogged down" in endless negotiations or "crash out" without a deal. She said the UK did not want a trade arrangement based on any other country but "a deal that is right for the UK". Labour leader Jeremy Corbyn said Mrs May had only just "scraped through". The negotiations so far, he said, had been "punctuated by posturing and delays", with confusion about how legally watertight the agreements were. Updating Parliament on the terms of Friday's phase one agreement - which is expected to be approved by the other 27 EU leaders later this week - the PM said it would see the UK pay a "fair" divorce bill, avoid a hard border between Northern Ireland and the Republic of Ireland and see the rights of UK and EU expat citizens "enshrined in UK law and enforced by British courts". But she said that if the UK was not able to agree a withdrawal deal with the EU prior to its scheduled exit in March 2019, "this deal is off the table".